This warning will be shown on the Azure portal for the Azure VM, if the VM was only shut down from within the VM via the RDP session. The second step to totally shut down the VM, is to go to the Azure portal and choose the Stop option at the top of the Essentials blade or use PowerShell to stop the machine. This will deallocate the VM, and incur no more compute charges. In a previous blog, we noted that remote users of the company were unable to connect from their W10 laptops, into Azure File Storage services, because their ISPs were blocking Port 445, required for SMB 3.0 transmission. FileVista web-based file manager to the rescue! Create an Azure WS2016 VM with SQL Express (and SSMS) with 1 additional attached data disk; with a Static IP address & Network Security Group Inbound Rules for HTTP & HTTPS. RDP into the VM to add IIS Role and features; add Inbound & Outbound Port 80 & 443 in Windows Firewall. Install, configure & customize FileVista, after creating the new website. While trying to create a mapped network drive on a local Windows 10 (W10) client machine to Azure File Storage service, we got the ‘Error 8007003 – Network cannot be found‘ consistently when using Windows “Map network drive…” functionality. When using the net use command in an elevated Command Prompt, the ‘System Error 67 has occurred. 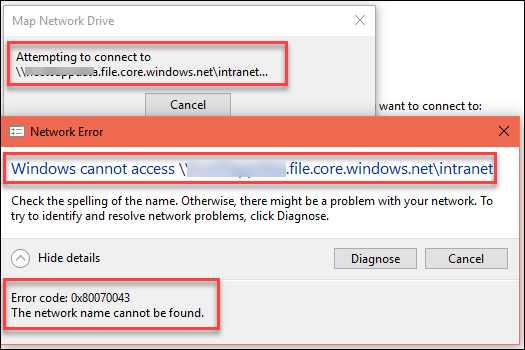 The network name cannot be found‘ error occurred. ‘Single Tier webserver’ is a VM with both IIS and SQL Server on the same machine, which is adequate for a development environment. Azure provides Windows images with the latest updated versions of SQL Server or SQL Express and SQL Server Maintenance Studio already installed. These pre-installations are a great time saver, to not have to download the SQL Server software and then go through the extensive installation and update process. The VM will also have an additional attached data drive installed with folders linked for SQL user databases. All that is required is to enable the sys admin (sa) account (optional).